I am always happy to see my neck of the woods spruced up with things that will be useful to me, especially the spartan span of Third Avenue characterized by auto shops that I trek along twice a day to and from my children’s school. 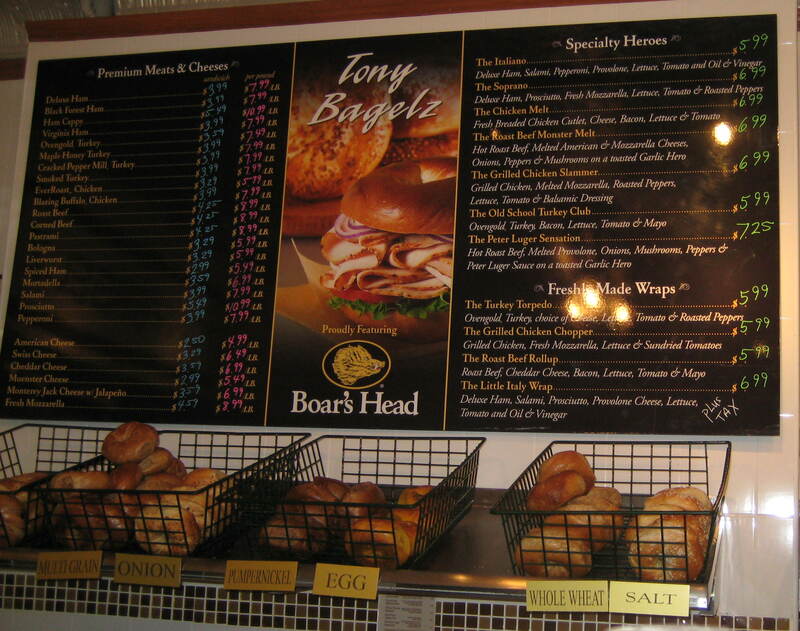 Enter Tony Bagelz – the name alone makes me laugh out loud. Tony was a co-founder of Park Slope fixture La Bagel Delight on Seventh Avenue, honing his knowledge of the bagel business over the years. But as a local who seems to know everyone around, he wanted to do something for his neighborhood, and so his own bagel shop-slash-mini-mart was born. The bagels are pretty good; the coffee is tasty; the service is super friendly and best of all for any clean freaks out there, it is nice and new and clean inside. Out back there is a large patio area with tables and umbrellas, which I can see becoming handy for local parents needing someplace to stop and feed their kids on the way home from nearby schools Rivendell and PS 372, The Children’s School. Tony says he’s planning to install some sort of water feature outside, too. The new spot is a stone’s throw from Crooked Tail Café but the vibe is so much cheerier, and comes complete with an ATM and last-minute necessities like milk, juice, toilet paper and Italian bread for the evening dinner, so I don’t see Crooked Tail snatching much business from Tony Bagelz. Also on track to open very soon is a revived pizzeria on the corner of Third and Carroll streets, where Bella Maria was until a few months back before quietly pulling down the shutters and joining nearby landmark Monte’s Venetian Room, whose claim to fame was being the oldest restaurant in Brooklyn dating back to 1906. New owners are moving into the Bella Maria digs, with a June 1stopening slated. The boys who’ve been toiling to empty the restaurant and get it ready for its new life say the place will be called Benvenuto, which means “welcome” in Italian. They also say there will be an adjoining Italian ice joint, which is going to make my daily stroll up Carroll Street a living hell each summer day as my kids beg for an ice. Still, it will be nice to see some life back on that corner. 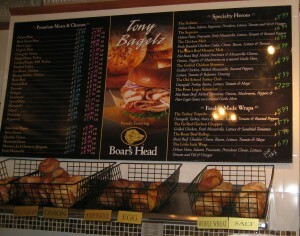 Tony Bagelz is at 284 Third Avenue. The new pizza spot is on the corner of Carroll and Third and Crooked Tail Cafe is at 272 Third Avenue.